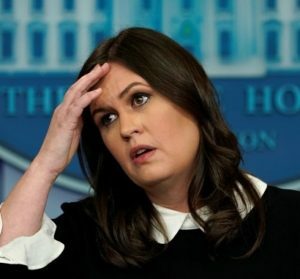 Trump hates the news media, and Sarah Sanders, his press secretary, is more than willing to carry this water for him. She’s not above lying herself, and she’s too lazy to do simple fact-checking. This time, she earned Four Pinnochios from the Washington Post, which called her statement an “urban myth” that was debunked years ago. Read story here. Of course, if she wasn’t such a blockhead, she wouldn’t work for Trump in the first place.